Empowering communities, replenishing the ocean. Net-Works has been established in the Lake Ossa region of Cameroon, Central Africa, since mid-2015. 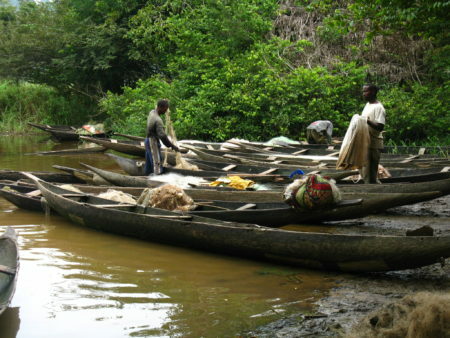 The Lake Ossa Wildlife Reserve on the Lower Sanaga River is a refuge for the endangered West African manatee and freshwater turtles, and qualifies as a Key Biodiversity Area. 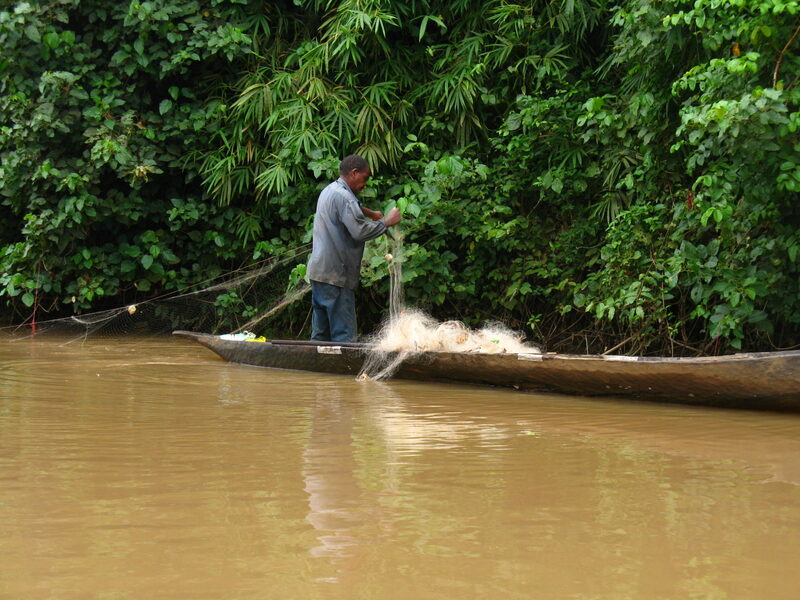 More than 80% of the households neighboring Lake Ossa depend heavily on the lake and reserve for their livelihoods. 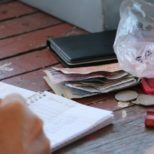 There are high levels of poverty and limited access to education, financial resources, and health services. Abandoned fishing nets present a serious problem for the ecology of the lake, entangling manatees and other freshwater species, creating navigation hazards, and destroying the natural habitat. There are 9 communities in the Lake Ossa region involved in Net-Works. Five are located close to the lake itself, one by the river, and three are along the coast. 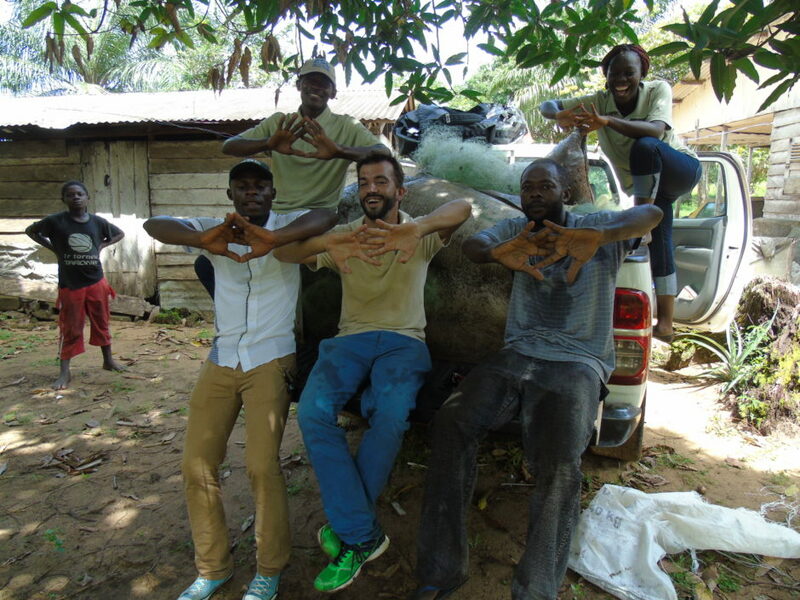 Santiago Ormeno (centre) and Fanny Djomkam (back right) from the Net-Works team in Cameroon. In the future we plan to expand Net-Works to more communities in Cameroon, particularly to some of the larger fishing communities along the coast by the marine protected area of Douala-Edea Wildlife Reserve. Discarded nets in Lake Ossa threaten endangered species such as the West African manatee and freshwater turtles. 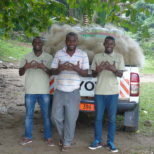 Net collection started in the Lake Ossa region in mid-2015 and has since expanded from lake-side communities to those along the coastline as well. 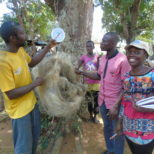 Local community members weighing the nets after collection. Net-Works Project Manager Santiago checks the nets along with members of the community. The Lake Ossa Wildlife Reserve ‘Our Lake, Our Life’ project is a ZSL initiative that is working to ensure the sustainable management of the reserve, which is an important refuge for West African manatees and other freshwater biodiversity. 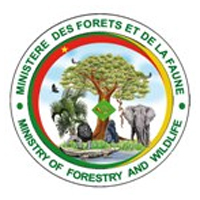 MINFOF is the government ministry charged with overseeing management of forests and wildlife in Cameroon, and the Lake Ossa Conservation Service manages the Reserve and is charged with its protection and management. MINFOF Conservation Service are directly involved in the implementation and oversight of Net-Works.